A tire pressure monitoring system is an electronic system that maintains the air pressure inside the tires on various types of vehicles. The purpose of the tire pressure monitoring system in automobiles is to inform that at least one or more tires are significantly under-inflated, which is likely to create unsafe driving conditions. Governing bodies and authorities working for the development of vehicles and improvement of driving conditions for drivers and passengers are enacting stringent norms on vehicle manufacturers to improve safety features in their vehicles. The tire pressure monitoring system is a safety feature provided in vehicles to maintain the proper tire pressure, as correct tire pressure can decide how much load the tires can carry safely. Concerns about correct tire pressure and its impact on vehicle safety, carbon emissions, and fuel-efficiency are not specific for any region, hence all regions are making constant improvements toward the adoption of the tire pressure monitoring system. A series of vehicle accidents caused due to bad tires in the early 2000s prompted legislators in the U.S. to include the tire pressure monitoring system as part of its TREAD Act legislation, which was intended to address growing driver safety concerns. Presently, in the U. S., all new vehicles are incorporated with tire pressure monitoring systems. According to United Nations regulation UNECE-R64, countries and sub-regions in Europe adopted a legislation about tire pressure monitoring system for new vehicle models, which began from the end of 2012, and also for all vehicles from November 2014, primarily for environmental reasons. A similar tire pressure monitoring system legislation to that of Europe has been adopted by South Korea. Likewise, major economies in Asia Pacific, such as China, Japan, India, and those in ASEAN, are in the process of implementing a legislation on tire pressure monitoring system. In terms of type, direct tire pressure monitoring system (TMPS) is the leading segment of the tire pressure monitoring system market for automotive. The direct tire pressure monitoring system has various advantages over the indirect system, as it delivers accurate pressure for every tire, no leach is caused in the tire pressure information by tire rotation or replacement, sensor batteries generally last as long as the life of vehicle, and they can monitor the spare tires also. This is likely to make direct tire pressure monitoring system a leading segment of the market. However, its high price is a key factor, which is expected to hamper the segment. The intelligent tire pressure monitoring system segment is gaining share in the market due to its advantages, such as it can control engine power and braking at every wheel when control computer senses a sideslip, which is expected to help maintain stability of the vehicle. Asia Pacific held a notable share for global tire pressure monitoring system market for automotive in 2017. The need for transportation has been rising from the last few decades, which has been driving the automotive industry at a consistent pace in countries such as China, India, Japan, and South Korea. 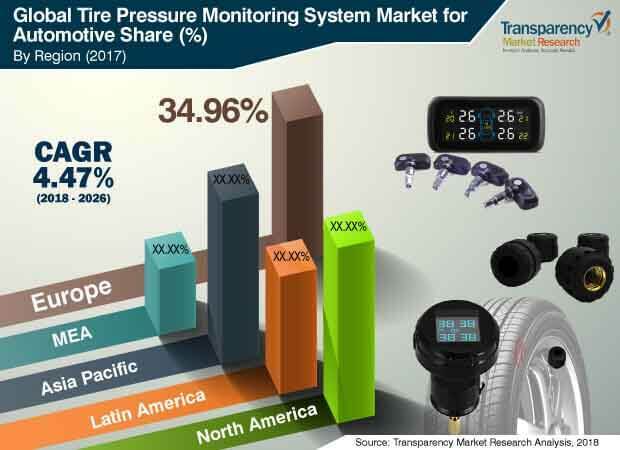 Increased population, which has led to a rise in number of vehicle users, rise in standard of living, and availability of jobs that offer higher wages, which helps boost purchasing power, are major factors that drive the tire pressure monitoring system market for automotive in Asia Pacific. Additionally, expanding economies of Asia Pacific are demanding vehicles with more safety features, and increase in investment by the global players for tire pressure monitoring system in the region propels the mass production procedures such as assemble line production. These factors are expected to increase production in the region. The tire pressure monitoring system market in Latin America is likely to expand at a significant growth rate, owing to the rise in vehicle production in Latin America post political instability and recession. A key factor for the considerable expansion of the market in the Latin America is important investments by major OEMs and initiatives by the governments of countries in the region, which eventually is enhancing production of vehicles. This, in turn, is projected to fuel the demand for tire pressure monitoring systems. Rapid expansion of the economies of Brazil and Mexico and increasing need for more safety and convenience are anticipated to boost the demand for tire pressure monitoring system in Latin America. Various decisions by countries in Europe have negatively affected business in the region. Rise in revised taxes during Brexit is likely to hamper production and sales of automobiles in Europe, which in turn is predicted to restrain the tire pressure monitoring system market for automotive in the region. The OEMs segment held a major share for tire pressure monitoring system market, in terms of volume, in 2017. Major associations have enacted various norms to improve the safety systems in vehicles. These mandatory norms for all OEMs led to the major share held by the OEMs segment in 2017. In terms of volume, the aftermarket segment held a relatively minor share of the market; however, in terms of revenue, the aftermarket segment held a higher share of the market, as compared to the OEMs segment, due to higher price of the system in the aftermarket. The tire pressure monitoring system market for automotive is dominated by the presence of major market players, as design, manufacturing, and fabrication of tire pressure monitoring system needs considerable precision, advanced R&D facilities, and more advanced technology. Furthermore, it requires technical expertise and high investment. Major players operating in the global tire pressure monitoring system market for automotive include Valeo, Robert Bosch, ZF Friedrichshafen AG, Continental AG, Sensata Technologies, Inc., Denso Corporation, Pacific Industrial Co., Ltd., NXP Semiconductors, WABCO, Huf Hülsbeck & Fürst GmbH & Co. KG, NIRA Dynamics AB, Bendix Commercial Vehicles Systems LLC, Dunlop Tech GmbH, Hamaton Automotive Technology Co., Ltd., Bartec USA LLC, and ATEQ. This report analyzes and forecasts the market for tire pressure monitoring system for automotive at the global and regional level. The market has been forecast based on value (US$ Mn) and volume (million units) from 2018 to 2026. The study includes drivers and restraints of the global tire pressure monitoring system market for automotive. It also covers the impact of these drivers and restraints on the demand for tire pressure monitoring system during the forecast period. The report also highlights opportunities in the tire pressure monitoring system market for automotive at the global and regional level. The study provides a decisive view of the global tire pressure monitoring system market for automotive for vehicles, by segmenting it in terms of technology, type, vehicle type, sales channel, and region. These segments have been analyzed based on present and future trends. Regional segmentation includes the current and forecast demand for tire pressure monitoring system in North America, Europe, Asia Pacific, Latin America, and Middle East & Africa. The report also covers demand for individual application segments in all the regions. The study includes company profiles of major players operating in the global market. Key players in the tire pressure monitoring system market for automotive include Valeo, Robert Bosch, ZF Friedrichshafen AG, Continental AG, Sensata Technologies, Inc., Denso Corporation, Pacific Industrial Co., Ltd., NXP Semiconductors, WABCO, Huf Hülsbeck & Fürst GmbH & Co. KG, NIRA Dynamics AB, Bendix Commercial Vehicless Systems LLC, Dunlop Tech GmbH, Hamaton Automotive Technology Co., Ltd., Bartec USA LLC, and ATEQ. Market players have been profiled in terms of attributes such as competitive landscape, manufacturing footprint, company overview, financial overview, business strategies, and recent developments. The market for tire pressure monitoring system for automotive is primarily driven by the rising demand for eco-friendly vehicles. The report provides the estimated market size of tire pressure monitoring system for 2017 and forecast for the next nine years. The global market size of tire pressure monitoring system has been provided in terms of revenue and volume. Market numbers have been estimated based on key type, technology, vehicle type, sales channel, and regional segments of the tire pressure monitoring system market for automotive. Market size and forecast for each major type and vehicle have been provided in terms of global and regional/country markets.